Even though this Tweety mural was painted in Hamilton, Ontario, I sell adorable bird themed wallpaper murals that ship for FREE in Canada and the USA. They are super easy to hang and totally removable when you’re ready to redecorate. 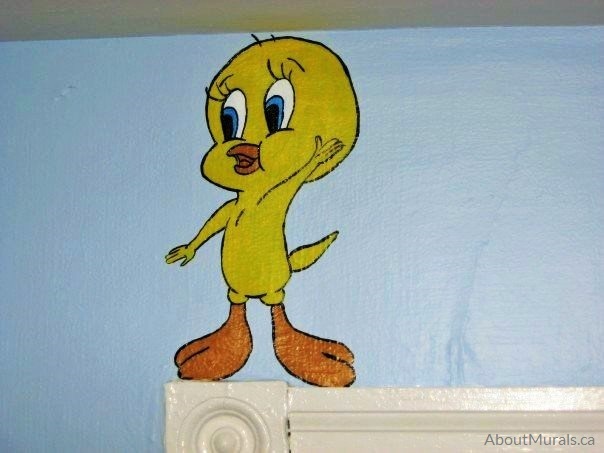 Thinking of a Tweety mural for your kids playroom? Here’s a pic of a mural I painted to give you some ideas for your own space. Lisa is a huge fan of the Looney Tunes and her favourite character is Tweety bird. She wanted a wall mural of him waving to her new baby boy in his nursery. I only use non-toxic acrylic paint and no-VOC latex paint for my murals, so your kids are safe to play and sleep in their bedrooms – even on the night that I finish painting. My wallpaper murals are eco-friendly, too! Like My Tweety Mural? Hire Me! Still thinking of a Tweety mural and like my style? Let’s work together! Or…Check Out My Bird Themed Wallpaper Murals! Join my newsletter community and I’ll keep you posted on all the latest promotions…and might even send you a hot coupon code or two!